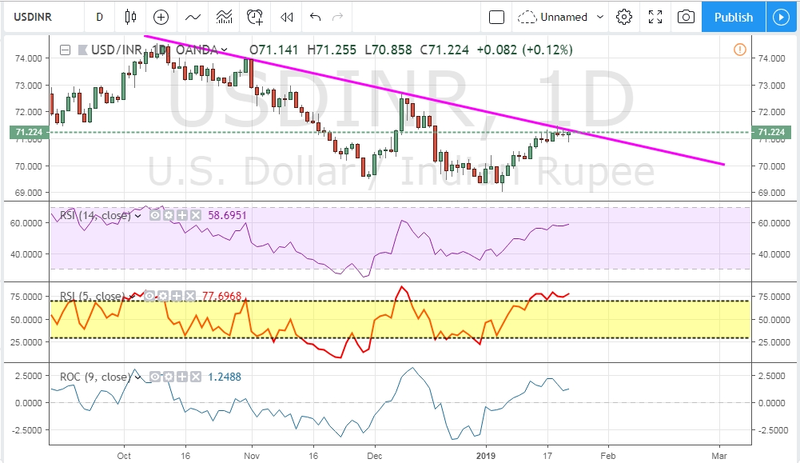 Our options market model is suggesting that after being bullish on INR since 69.5 per USD, the retail sentiment has just turned bearish on INR as the pair is testing a resistance area near a crucial downtrend line. Take a look at the chart for greater clarity. The retail bullish sentiment peaked on last Thursday and has been gradually declining since. It first took a dip on the bearish territory but finished the day being bullish on INR. But today, according to data from India’s National Stock Exchange, the retail sentiment maintained in the bearish area. A shift in sentiment is extremely significant at this crucial resistance area. It is likely that the pair would decline from here. However, today’s price action would be very important since the only option for the USD/INR would be a breakout if it doesn’t decline. It is also important to note that since the broader trend is still bullish for USD/INR, a breakout aligns with the longer term trend. In either case, expect higher levels of volatility.